With dotted lines, you can see that if a shoulder raises, its corresponding elbow does so as well.The same is true with hips and their corresponding knees and feet. Once we have finished our skeleton, we add volume. It is more convenient to simplify this task by dividing it into two great volumes; one in the chest and the other at the hips. Once we have place these two great masses, we may begin to join them and "cover" them with flesh. 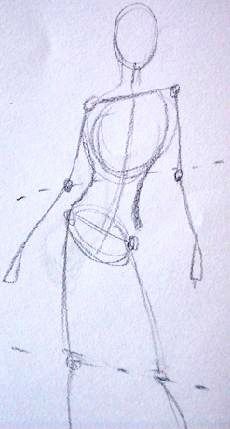 This character will be a girl, so I draw her waist narrower.